We recently started reviewing shapes with my youngest (age 3). 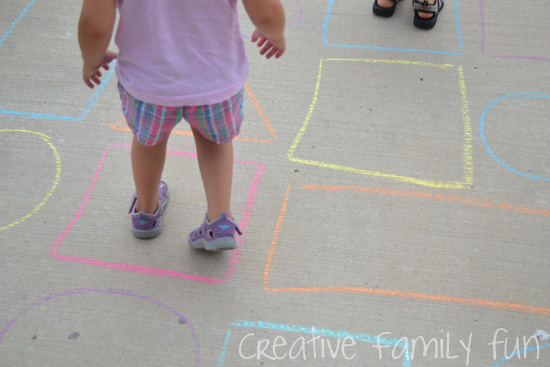 One thing I love about learning shapes is that there are so many fun ways to teach them… endless ways to learn about them! 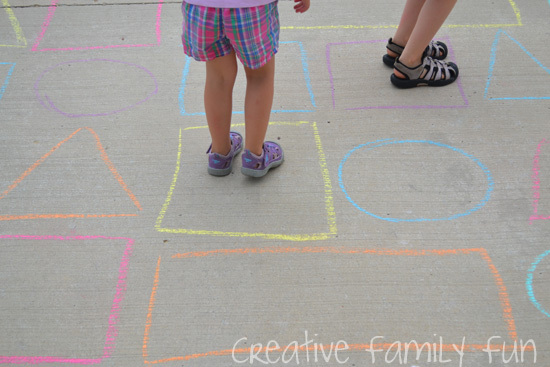 So, while the weather was nice, it was time for an outdoor shape activity. 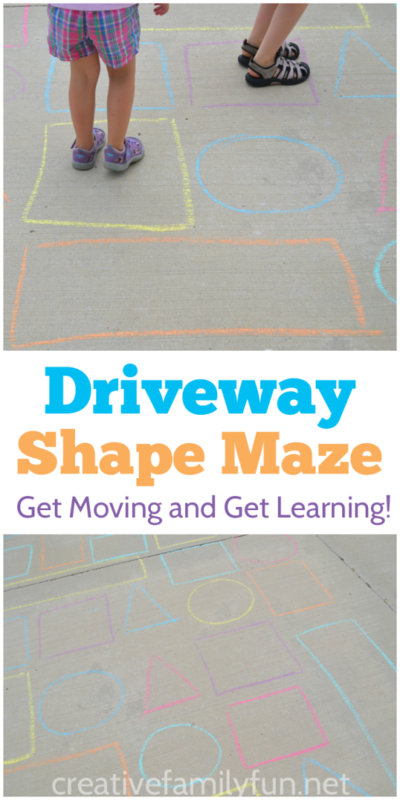 This Driveway Shape Maze is perfect for kids who like to move and learn outside. 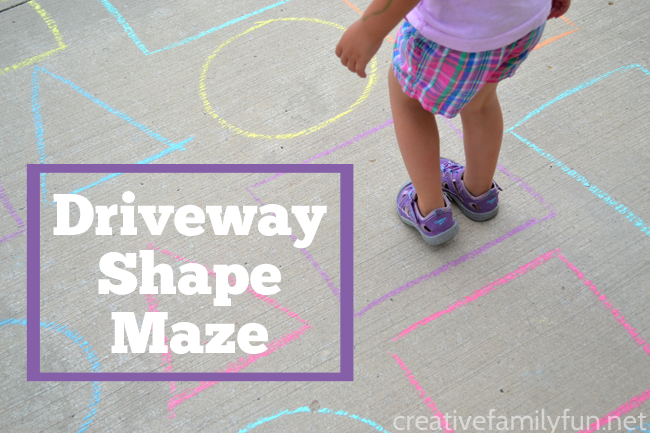 This outdoor shape activity takes a little effort to set up, but you’ll be able to play with it for days (at least until it rains). Grab your sidewalk chalk and let’s get going. 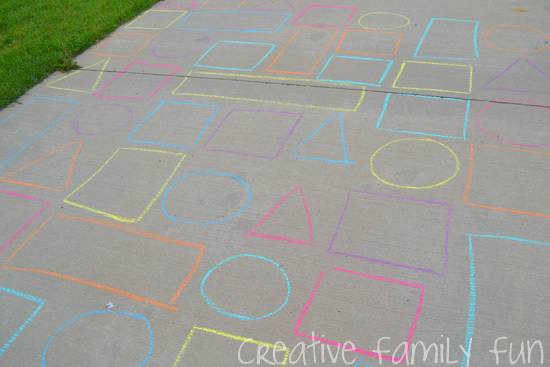 One beautiful morning, I ran outside, grabbed the sidewalk chalk, and started drawing shapes. I filled in a substantial section of our driveway. We have been working on one shape at a time and the current focus is squares. So, I made sure to include more squares than any other shape. You can focus on any shape or draw a variety of all the shapes. When the girls came outside, I explained the game to them. They each stood in a square on the first row, then they had to get to the other side, stepping only in squares. Both girls had a lot of fun with this game. Even my oldest (age 5), who knows her shapes really well, loved the physical aspect of the game. She soon challenged herself with all the shapes and also tried to see if she could jump over shapes and make giant steps. *Go through the maze many times choosing a different shape each time. First step on squares, next step on triangles, and then step on circles. 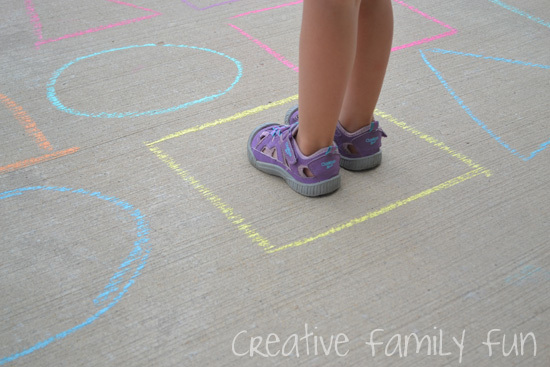 *Instead of just walking a maze, challenge your child to jump on all of the squares or all of the circles. 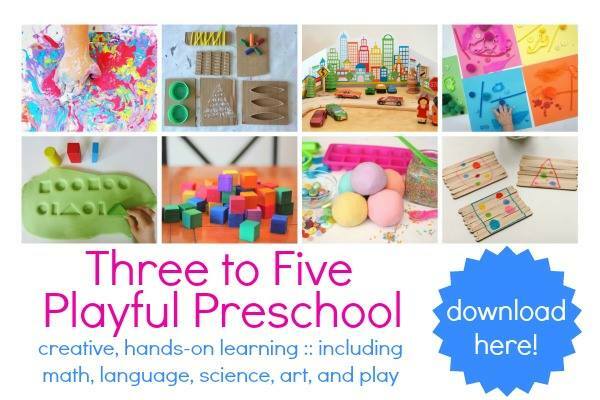 *Adapt this for older kids, by adding more challenging shapes like octagons and hexagons or 3-D shapes like cones or cubes. You could also make a maze identifying the different types of triangles, like equilateral triangles and right triangles. It’s easy to add a little physical movement to learning. You can play the same game using numbers or even the letters of your child’s name. Have fun learning! Time Needed: At least 15 minutes to play. Notes: This is a great project for some spur-of-the-moment fun. And, if you don’t want to draw the whole maze yourself, enlist the family and get out there together!